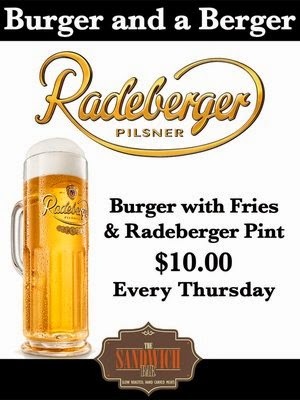 I'm a sucker for a great burger + beer special, especially on a Thursday to get you in gear for the weekend! I spotted this one today at The Sandwich Bar, which is strategically located close to other places of drink, including MP Taverna, which also boasts a great Happy Hour special. Try one, try both - whatever strikes your fancy.